What do you see in a dashboard? In a dashboard, you see how far something has progressed. You track your child’s performance in school through a progress report. When you are at work and your favourite football team has a big match that day, you quickly go online and lookout for the scoreboard. So, you see progress indicators, graphs, statistics, and other key performance indicators to help you quickly get an idea about what is happening by then. 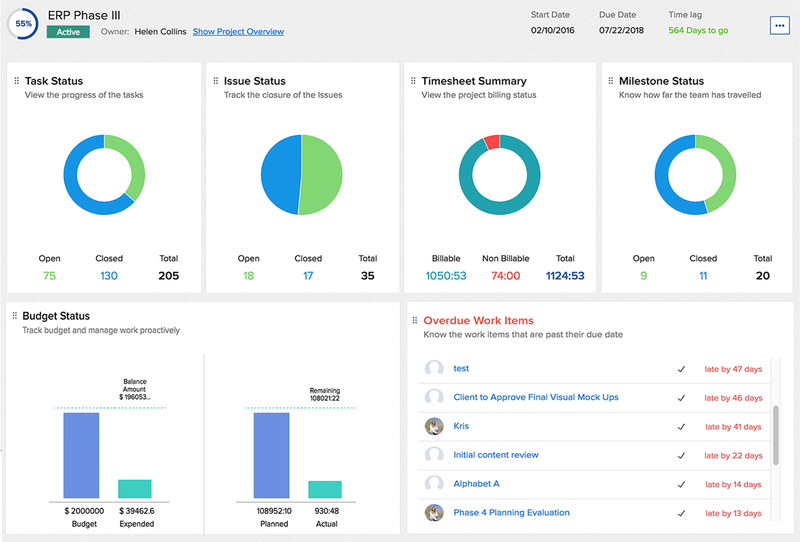 How can you effectively use the project dashboard in Zoho Projects? The widgets showcase the status of the team in the best possible way. You can reposition widgets, change the chart type, and access data quickly in the dashboard. Your need permission to view the respecitve module to view the widgets on the dashboard. Click to learn more about access privileges for various modules in Zoho Projects. What else can you do in the Project Dashboard? The widgets - Task Status, Bug Status, and Milestone Status show how many work items are closed and how many are open. The widgets - Team Status, Top 5 Taskminators, and Top 5 Bugminators display data that measure the team's performance. Team Status - It displays the count of the overdue and open work items for every user in the team. It also displays the number of tasks or bugs to be addressed by the user on the current day. Top 5 Taskminators - The users with the maximum number of closed tasks are listed in this widget. Top 5 Bugminators - The users with the maximum number of closed bugs are listed in this widget. The widgets - Task Progress Chart, Weekly Digest, Timesheet Summary, and Budget Status display the work status in the form of reports and graphs. Task Progress Chart - Get the task count against a specific completion percentage from the graph. Hover over any shaded part in the graph to get the exact task count against a completion percentage. Weekly Digest - Get the status of the tasks, tasklists, milestones, and bugs in the current week from this widget. Select a week from the dropdown to view its status. You can also select a different view from the lot in the upper right part of the widget. 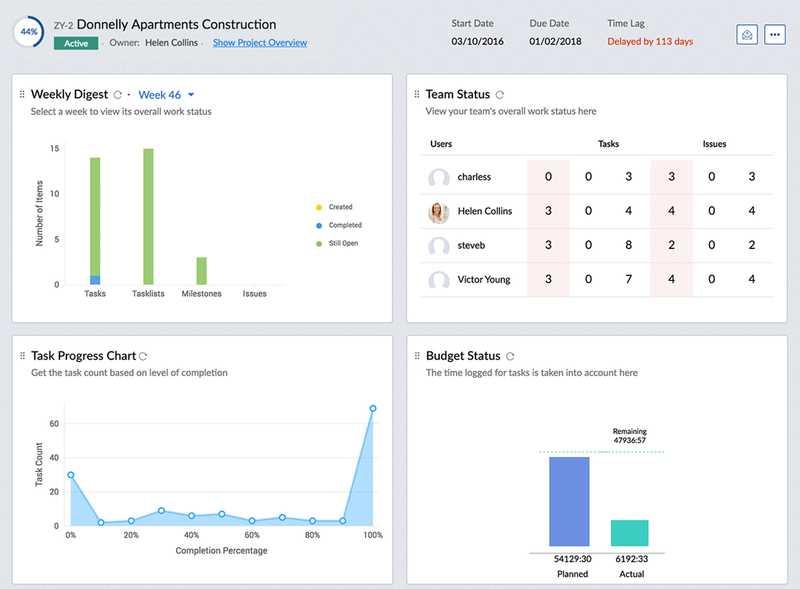 Budget Status - Track the budget and ensure whether the team is on track. 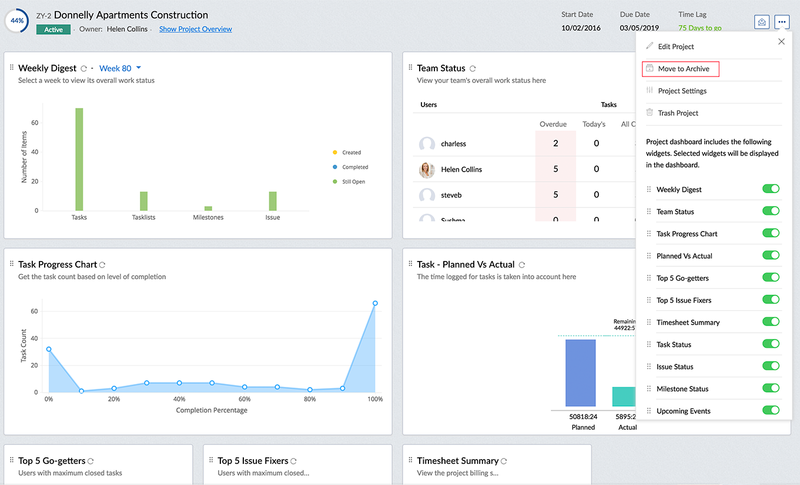 You can also measure the team's productivity with the help of the Planned vs Actual section. Timesheet Summary - Track the billable and non-billable hours that are logged by the team. The widgets - Today's Work Items, Overdue Work Items, and Upcoming Events display the work that is yet to be completed. Today's Work Items- Get the list of the work items that are scheduled for the current day. Overdue Work Items - Get the list of the work items that are incomplete and have gone past the due date. Upcoming Events - View the events that are scheduled for the current week. Click Dashboard from the left panel. Click in the upper right and click Edit Project. Modify the Project Overview section. You can also choose to Show Project Overview By Default. After you save the changes, the updated project overview will reflect like the following. You can also Hide Project Overview if you don't wish to see it whenever you land on the project Dashboard. You can also edit the project overview from Projects. Stay up to date in the project with the help of notifications. Click in the top band and view the latest updates in the project. You can also navigate to a specific work item from the notification panel itself. From the dashboard, you can also edit the project information and get the Email Alias to add work items from your registered Email address to your Zoho Projects portal. Click in the upper right and click Project Settings. Click Edit Project in the upper right in the defaulted View Details page. Edit the project information wherever necessary and save the changes. Click in the upper right and click Move to Archive. You can also archive a project in Project Details. Click in the upper right corner and click Project Settings and then click Move to Archive. Click in the upper right to rearrange the widgets. Below the Delete Project option, you will see the complete list of widgets available in the dashboard with their respective ON/OFF status. When you toggle a module to green, you enable it. When you toggle it to grey, you disable it. You can also drag and drop a widget and place it above or below another widget to reorder it.